In the UK, the Next chain of stores has started selling "all-in-ones". 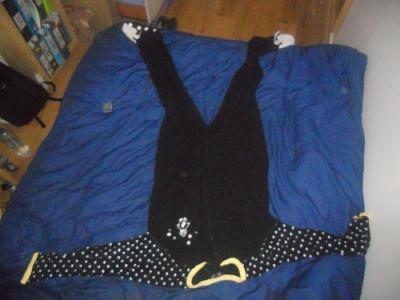 Unlike the footed pajamas offered by Primark, these garments do not have attached feet. Spotting them in their latest catalog, I snapped up a pair and am putting my knowledge of footed sleepers to good use by way of a thorough review. As a control, I will compare them to Primark sleepers. Unlike other all-in-ones you may find in-store or online, these are made from chenille as opposed to polar fleece. Next offers cotton alternatives as well. 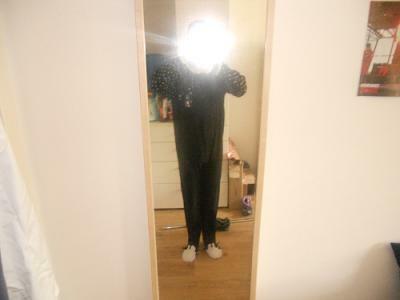 Due to the fabric's characteristics, the pajamas are quite thick. The chenille is of excellent quality and very soft, much more so than standard polar fleece. Also, the garment is measurably warmer, likely attributable to the increased thickness. The cuffs at both wrists and ankles are made of cotton. 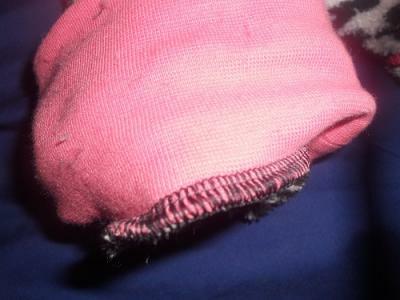 They do a very satisfactory job in keeping the sleeper's arms and legs from covering the wearer's hands and feet. Furthermore, the zipper is generously-sized in comparison to others I've seen featured elsewhere. It would likely take quite a bit of force before breaking. While I have not owned the sleeper long, it has held up very well. The stitching is of high quality, evidenced by the lack of loose threads or tears commonly caused through movement. Those who toss and turn in their sleep need not worry about damaging this sleeper; it appears designed to last. These days, it seems that your standard footed pajamas are not enough for the average consumer. 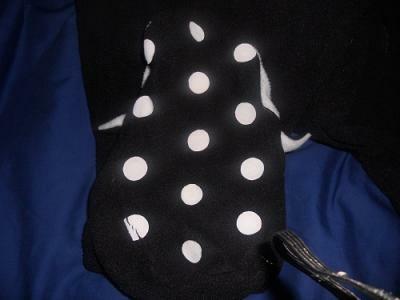 Case in point, the pajamas I own came with a hood; they're a snow leopard-themed pair, as seen in the photos. The hood is made up of the same material as the rest of the garment. 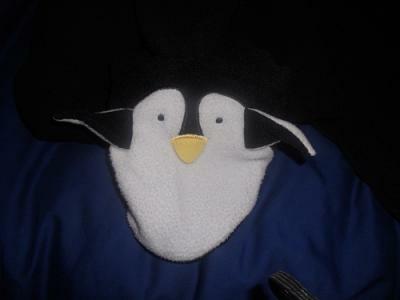 With the exception of the attached ears, the inner part of which is polar fleece. The hood is of the same quality as the rest of the all-in-one and will keep your head warm should you find yourself chilled. 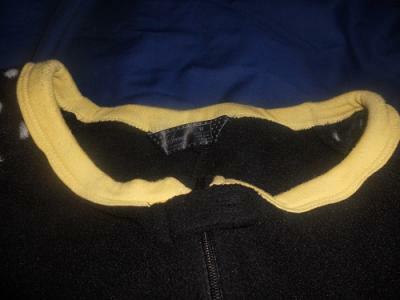 As for other features, there are two kangaroo-style pockets situated on either side of the zipper, as seen in the picture. Size-wise, chances are nothing larger than your hands will comfortably fit in these pockets. Also, a piece of fabric backs the zipper, preventing it from rubbing against the wearer, a big plus for those with sensitive skin. An additional feature, or rather lack thereof, is the absence of "feet", undoubtedly a deal-breaker for some and a winning prospect for others. While there are no adult sizes available for these sleepers, they do run up to size 16 for both boys and girls, meaning that an adult of typical height would find these of reasonable size. For example, I'm 5'6" and a size 16 fits me very well; in fact, there is enough leg room left for someone who is a bit taller. Unfortunately, the arms aren't as generously sized, so it may be wise to try before you buy if you have sizing concerns. Due to the quality of the material, it is a very soft garment and feels heavenly against the skin. It does not rub or feel tight anywhere, likely due to the bagginess of my sleeper. Depending on the size you purchase, the top of the zipper may rub against your chin when you lay down which may be slightly uncomfortable. The thickness of the sleeper renders it most appropriate to wear during the coldest nights of the year. While it isn't too uncomfortable during autumn evenings, I did wake up in the middle of the night feeling quite warm to the point where I had to remove the sleeper. Anything cooler than 10 degrees C at night should provide an undisturbed night's sleep. Likewise, it is still quite comfortable to wear during the day in similar temperatures. Rather than chenille, Primark uses standard polar fleece for its sleepers. This isn't necessarily a negative; it will still keep you toasty on those cold nights. They are significantly thinner, though, and not as soft as the Next pair, though that's not to say they're rough in any regard. Though Primark is synonymous with cheap clothing, the sleepers have held up very well. There is no wear worth noting and while the material has pilled somewhat, that is expected when dealing with polar fleece. The fabric is thin but hasn't developed any holes or tears through regular use. Also, they seem to have been stitched together superbly. Clearly, what it lacks in thickness, the garment seems to make up for in terms of durability. The zip is much smaller than that of the Next sleeper. It appears delicate and abruptly tugging on it wouldn't likely produce desirable results. 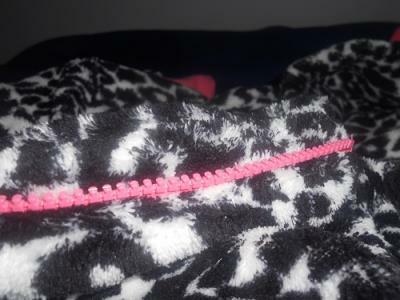 I doubt it will ever break, but if I were to pick one zipper to ever bust, it would be that of a Primark sleeper. Primark sleepers feature sewn-on "feet" and non-slip soles. The rubberized material on the soles prevents slipping and sliding. Unfortunately, this feature also means these sleepers cannot be tumble-dried, as it damages the rubber. After doing so, the feet lose much of their non-slip properties and become brittle. Even with proper care, the sole will break-up over time, inevitably developing small cracks in the rubbery material. Some of their sleepers that feature hoods and tails, but since mine do not, I can't comment extensively. In all likelihood, they will be of a similar quality as the rest of the garment. The hood will provide you a bit more coverage and warmth, as well. Unlike Next sleepers, Primark offers adult sizes. They come with extra room built-in; assuming you purchase the appropriate size, they shouldn't feel tight. Case in point, the first pair I bought was too roomy and I find, at times, the legs fall down and I end up walking on them rather than the feet. Additionally, they are generously-sized in the feet, though mine are somewhat small to begin with. The arms are also quite loose-fitting, enough so that I can wrap the excess material around my arms twice. As with the Next pair, these do not tend to rub against my skin uncomfortably. Similarly, they have material backing the zipper. The cotton material used in the collar is incredibly soft, so there is no scratching of the neck when you turn your head. Additionally, there are no uncomfortable labels; in fact, the one that exists is made of a silken material and quite unnoticeable.